I have to admit that I did not get this book. The entire first half I felt extremely lost and debated whether or not I should stop reading it and continue it at some future date. I still really don't get the entire point. The second half of the book was filled with Lewis' trademark descriptions of human character. I love how he paints a picture in your mind of exactly the way someone is by describing their attitudes and actions. In a few paragraphs you feel like you have a mental picture of the complete being. That is an amazing art! Apparently this is a book about a dream one man had of a trip to Heaven and Hell. I guess I just wasn't following closely enough or it went right over my head. Still, I felt particularly drawn towards Lewis' discussion of why it would be impossible, as a painter, to capture a view of Heaven. He says that we can paint pictures of Heaven on earth because we are seeing glimpses of it. However, we wouldn't be able to go to Heaven and paint a picture of it because it IS. It is not a glimpse, it is reality and it is meant to be seen and experienced as it is and not as we view it to be. I thought that was very intriguing. As a photographer, I like to travel to places with camera on hand and I like taking snapshots of "glimpses of Heaven" which I see and think are beautiful. I cannot presently imagine being in some place so beautiful that I am unable to photograph it because it is. At the same time, that's its true draw, beauty and enjoyment. No pictures necessary. That's an odd concept to get through the noggin', yet nevertheless it is intriguing. So while in this case, I do not think I appreciated the whole of this work, I enjoyed his book in part and someday when I'm wiser and more intelligent I'll take another whack at it and see what I can glean from it then. Feel free to leave comments of interpretation. Maybe it'll help. For now I just think I haven't read enough to appreciate what Lewis was trying to accomplish. I read this years ago (probably more than 20!) and enjoyed it, but as with most of Lewis's books, not as much as Narnia and the scifi books he wrote. This book is one of my all time favorites. It helped me see how I was choosing heaven or hell with every small choice I make. The scariest thing in the book was the way most of the people in hell, when given the opportunity to stay in heaven, chose to go back to hell. Thanks for an honest review. I am hoping to read several of Lewis' works this year. Now I'll be prepared for a little brain exercise. Glad you gave it a shot! This is definitely one that will reward rereading in a few years--or after you've read more of Lewis' nonfiction. Now I totally missed the part about the painter; I'll have to reread it again myself! one, it's a dream/vision. the narrator is guiding us through the dream/vision as he experiences it. two, it's about the things that we human beings want to hold onto rather than allow ourselves to be open to deep love. each "ghost" has something that s/he won't let go of - pride, reputation, fear. three, it's meant to help us reflect on what we are holding onto rather than let go, and enter joy. 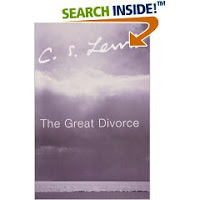 i'm trying to do a speach on the great divorce can any one tell me an interesting part that will not make to many people unconfortable but yet get the point across im reading the book but its hard to understand.